I don't remember where I got this recipe, but I found it over the weekend while I was digging around for stuff to cook this week. 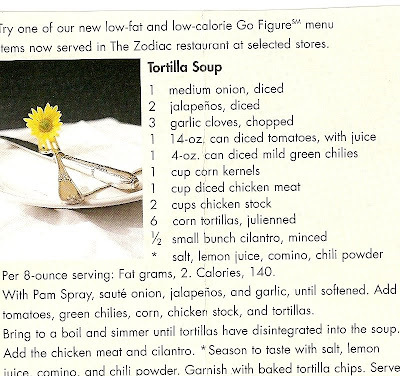 It's a Tortilla Soup recipe that they serve in Neiman Marcus' Zodiac Room. Low cal and Low fat. It took me about 30 minutes from start to finish and it was DELICIOUS. Enjoy.